"BILL BIGGART": a Chip East digital production? Chip East: the digital artist behind "Bill Biggart"? In the video clip below, Chip tells his remarkable story. He was just a news computer graphics guy stationed in NYC working with photoshop and digital computer imagery to show the "cause and effect" side of things in documentaries. He hit it off in class with a barely noticeable (didn't exist?) super-quiet Bill Biggart (R.I.P), who happened to be a real photographer (not a computer graphics storyteller, like Chip), and they became buddies. It turns out that Chip East is no small fry "Jimmy Olsen" type of of photojournalist, his photo credits often include shots of the UN Security Council and internationally famous politicians. In this link to a roundtable discussion of the digital media, Chip admits the lack of validation behind digital audio, video, still, and text in news "footage" and raises the issue of importance on keeping such graphics believable. 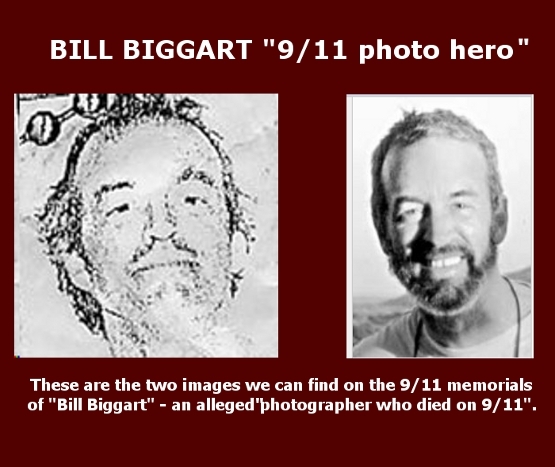 Bill Biggart's photos were picked up and promoted by "curator" George Azar, another "fotojournalist" who also has a track record of many lucky photos (for Aljazeera, etc.). 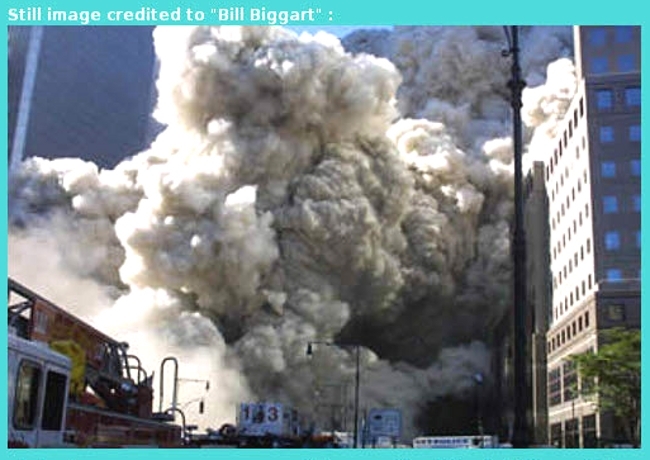 That website claims Bill Biggart was an active photojournalist with "Impact Visuals" however photo credits are scarce. That site claims he took photos for "Ireland: A Week in the Life of A Nation" in 1986, but his name does not appear with the book in a google search. 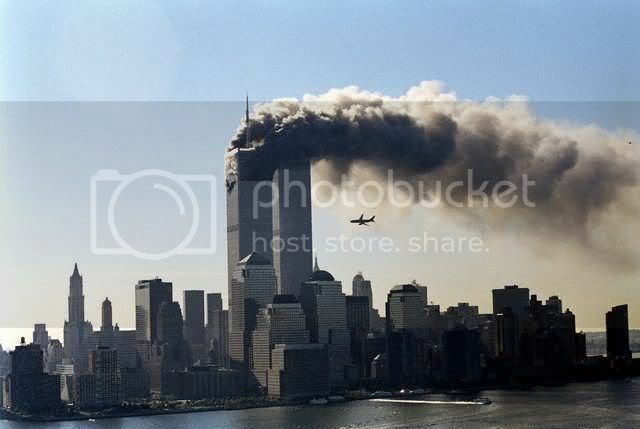 Admin notice (simonshack): Dear WmCooper99, I have allowed myself to edit this post of yours - just by making your photo links become visible - and by changing your original thread title from "Obscure Propaganda" to "The Phony 9/11 Photographers". Hope that's ok with you! Oh my - that video you linked is a must see ! "We've gotta find a way, I think, to make sure of ... whether its video, audio or still pictures - or even the text which goes with it ... we've gotta find a way to really validate that the content is true, and that readers will believe it." 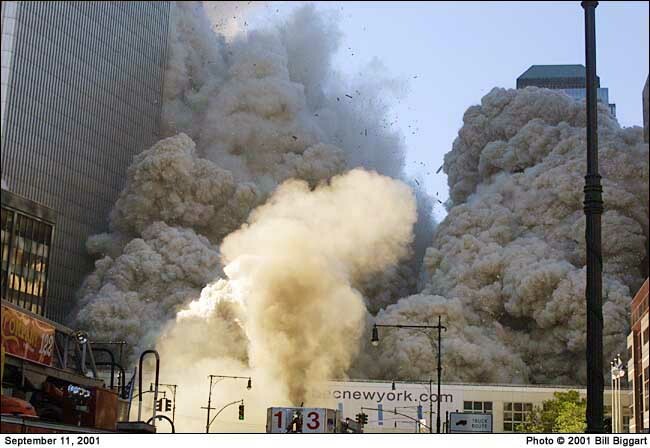 It's pretty convenient that "Bill Biggart" (the virtual photographer-entity most likely 'created' by CHIP EAST) should perish on 9/11 - "crushed under a tower collapse". You can't submit questions to dead / non-existing people, can you? 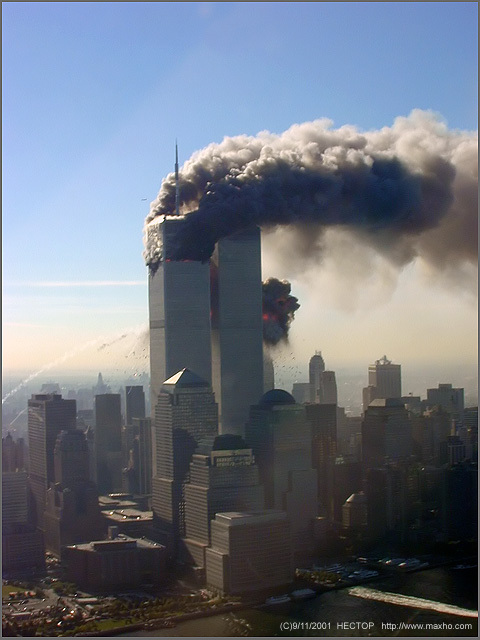 So ok, I won't submit questions - but I WILL submit yet another demonstration as to how the 9/11 imagery was put together - using digital templates to manufacture both videos and still 'pictures', in a chain-assembly sort of way. Here follow the 3 most (in)famous still images credited to this "Bill Biggart". 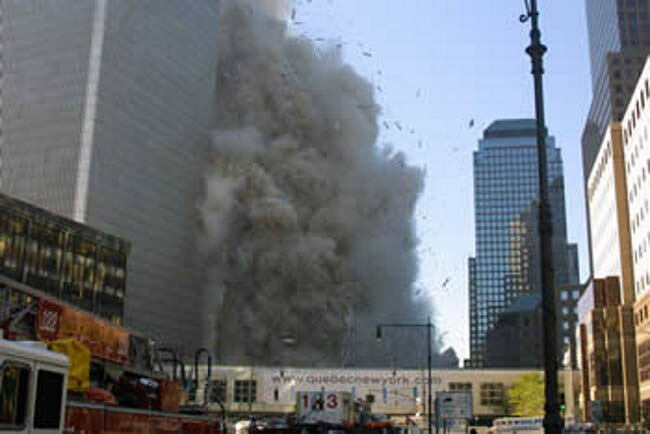 Yes, we are actually asked to believe that 'suicidal Bill' just stood there, as the WTC2 rumbled down towards him, and very calmly snapped three nicely framed shots - without the slightest thought for his own life. A truly heroic photographer, you'll have to admit! It appears to be an uncropped version of the above shot - yet a lamp post is clearly missing! Note also the oddly different, overall aspect of the entire, artificial-looking scenery - likely just due to being differently rendered digital templates. 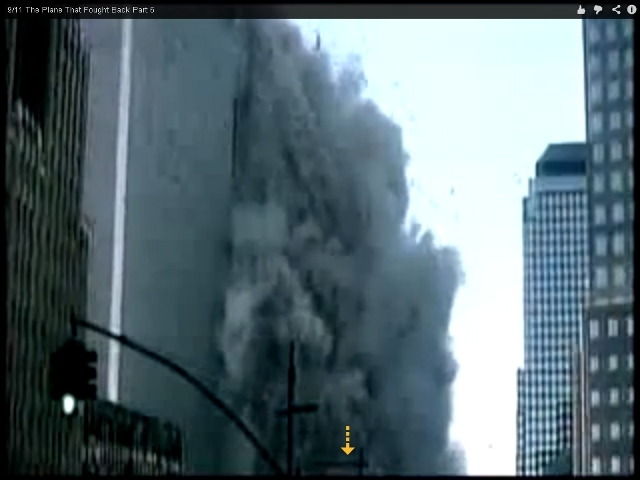 In fact, most of the early 9/11 imagery looked just as horrid and blurry as this. Sadly enough their plan worked for well over 200 million Americans that believe this stuff, so hats off perps you succeeded! It just goes to show that there is a reason for conspiracy: conspiracy works to fool people outside of it. Which is the point. We have definitely been played the fool by a large group of individuals who know enough to say something to spare their fellow cousins' pride, dignity, danger and humiliation ... but they choose not to. How very humorous on the part of the perps, is it not? Wow... well spotted Simon. I am speechless. Even without the mindfuck games with the names, what are the odds of these two pilots flying one right above the other at the same instant, documenting a few seconds apart the same crucial moment? So anyway, here goes - I need to tell the tale of YURI FAKTOROVICH once again, for those who never heard of it. Now, as I pointed out back then - YURI's distant view of Manhattan looked EXTREMELY SIMILAR TO THE NBC VIEW America saw on LIVE TV!!! Here are the successive still shots credited to YURI FAKTOROVICH who, apparently, was snapping pictures while piloting his Cessna! 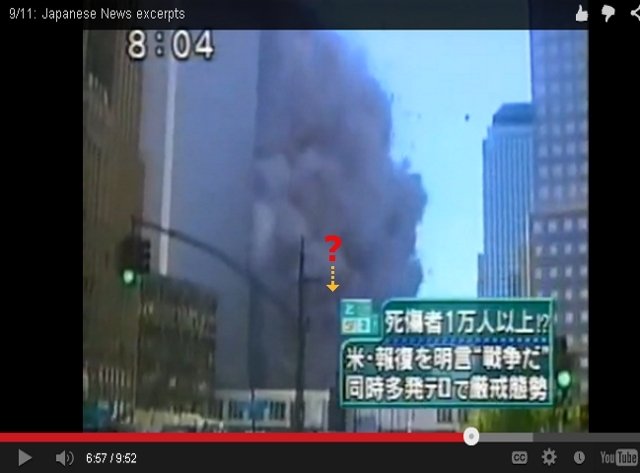 As I pointed out in the above image - there are NO TV choppers to be seen hovering around the WTC. 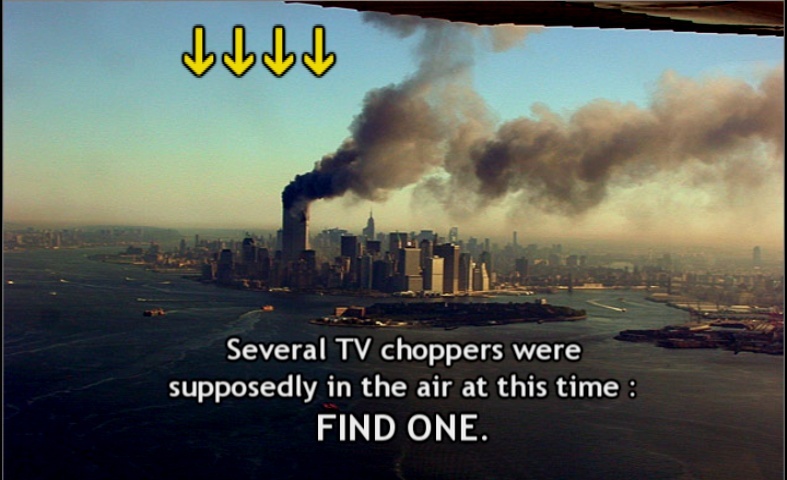 This is of course ridiculous, since we were told that at least 4 TV choppers were recording the 9/11 events the whole World saw on LIVE TV! This whole YURI FAKTOROVICH tale stank to such High Heaven that the perps have now opted to wipe it off the internet - and the 9/11 imagery history books. 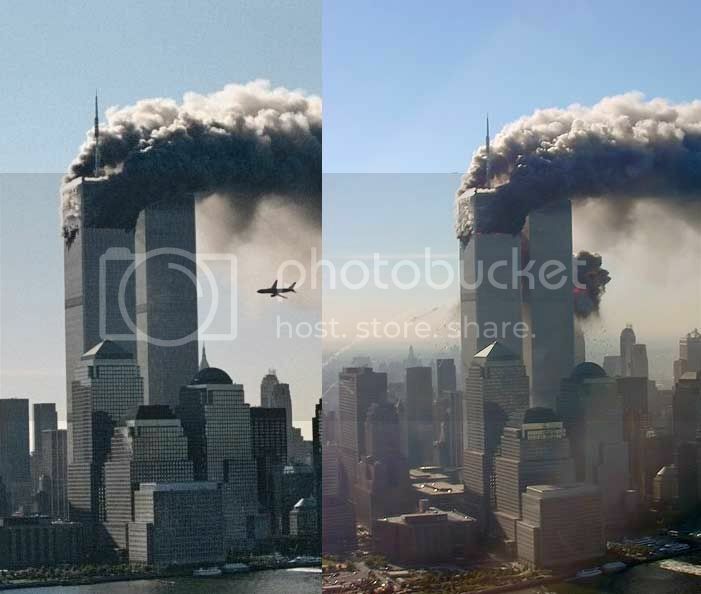 They appear to have decided (in 2010) to replace it with one single picture (slightly rotated) featuring "FLIGHT 175" just before it hits WTC2. But it is now credited to a Japanese photographer... "MASATOMO KURIYA" - a 'clever' anagram of "YURI FAKTOROVICH" (see my previous post above). A great find Simon! And they never fail to get a shot of the explosion and the smoke trail exiting the other side!! Interesting that you couldn't find any reference to the Russian pilot on Reality Shack - he has certainly been discussed before! Remember when I also failed to find an old post of mine which was regarding the Construction worker "witness" sitting n his truck with his hard hat on! I don't suppose information is being removed from that site surreptitiously? 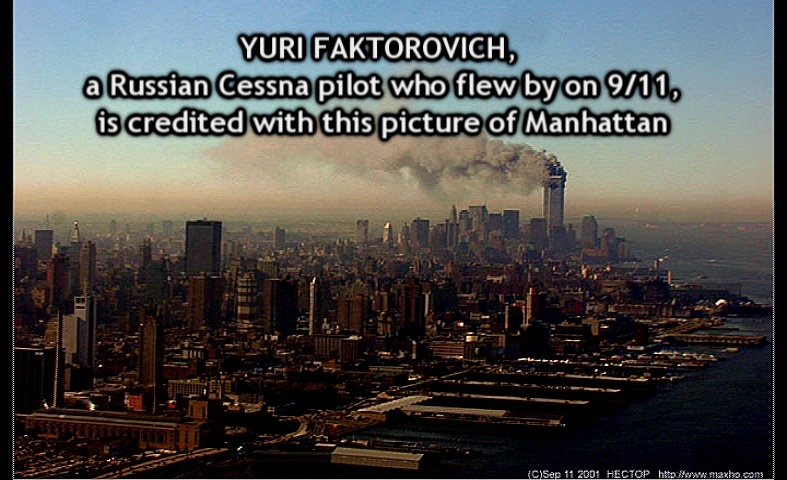 The mysterious Russian pilot Yuri Faktorovich who, we are told, almost collided head-on with "FLIGHT 175" (but managed to capture - singlehandedly while driving his Cessna - a spectacular close-up shot of the airliner crashing into WTC2...) appears to have returned to Manhattan that evening, to stroll around and make snapshots of the "MISSING" posters! 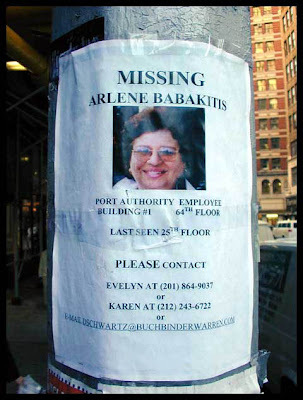 "Mr. Yury Faktorovich was kind enough to photograph some of the missing posters in NYC after the attacks of September 11th, 2001." Now - need we be surprised that the perps are now eager to wipe out their inane "Faktorovich"-tale from the history books? simonshack wrote: Now - need we be surprised that the perps are now eager to wipe out their inane "Faktorovich"-tale from the history books? Has anyone ever called those phone numbers on the missing posters? I wonder were they go to, I am sure you would get lot's of dead ends but I am curious about it. Maybe I will call a few just to see what happens. Human wrote: Has anyone ever called those phone numbers on the missing posters? I wonder were they go to, I am sure you would get lot's of dead ends but I am curious about it. Maybe I will call a few just to see what happens. Makkonen wrote: "Last Seen 25th Floor"